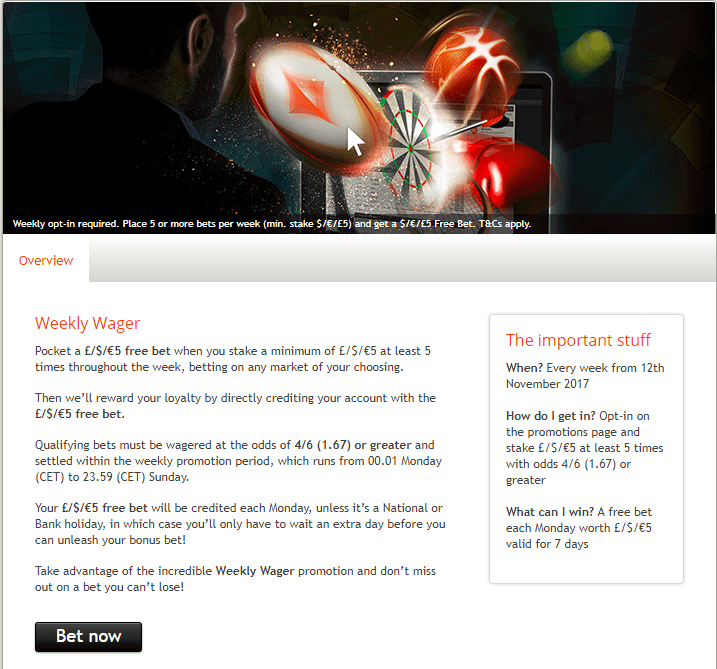 PartyPoker have a promotion that runs every week from Monday to Sunday whereby you bet 5 x £5 and receive a £5 free bet. This offer is very quick and easy to do, and it should definitely be part of your weekly matched betting routine. All events and markets eligible. Opt In required every week. Occasionally Partypoker will run a promotion that you can combine this with alongside. If not, just find close matches and place your 5 bets. To trigger the £5 free bet, you must place 5 bets of £5 or more at odds of 1.67+. Open up PartyPoker and your exchange and find a close match between the back and lay odds for any event and any market. 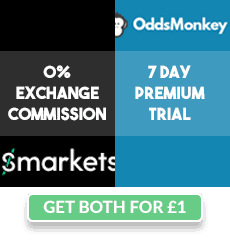 Alternatively you can use Oddsmonkey's Oddsmatcher and filter out Partypoker. Instead of looking for a match you can combine this offer with other PartyPoker offers, so long as bets are placed and settled between 00:01 Mon - 23:59 Sun. Stake at least £5 on your selection. (This needs to be done 5 times on different events). You can bet more than £5 if doing another offer. As long as it's at least £5 and odds of 1.67+ then it'll count towards the weekly bet club. You will receive your £5 free bet by 12pm (midday) on the Monday. I suggest betting on a team or horse with high odds (4.0+) to convert it into £7-£8 profit. This offer can be repeated weekly.